Right now on my easel is a private commission, a painting of H.P. Lovecraft. This is the color study. 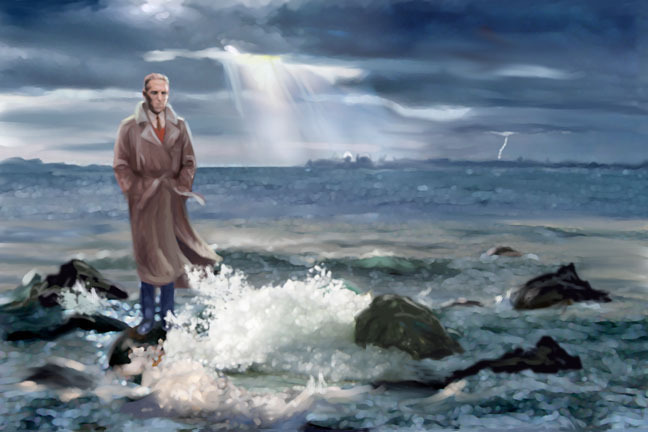 It shows Lovecraft standing on the rocks in Narragansett Bay with the city he loved, Providence, Rhode Island, in the background. The viewer can interpret for himself the meaning behind the stormy sky, lighting strike and troubled surf lapping at Lovecraft’s feet as he maintains his precarious footing. Click on the image to see a larger picture. This entry was posted in What I'm Working on Now (easel). Bookmark the permalink. Hi Von! The unveiling was a terrific time, thanks… I’ll soon post the finish of this painting as well as another painting that was commissioned by the same client, a portrait of Les Daniels. Cort, Looking forward to seeing this at the “finish line.” Yo! Cort, looking forward to seeing this one at the “finish line.” Yo! Thanks Dave! I’ll be posting the final image as soon as I get it from illustrator and old pal Tom Kidd who did an amazing job of taking a great digital image of the painting for me last week when I visited the Kidds on the way to Necon. I’ve seen this, when you posted it on FB! Beautiful work — quite the stormy background!